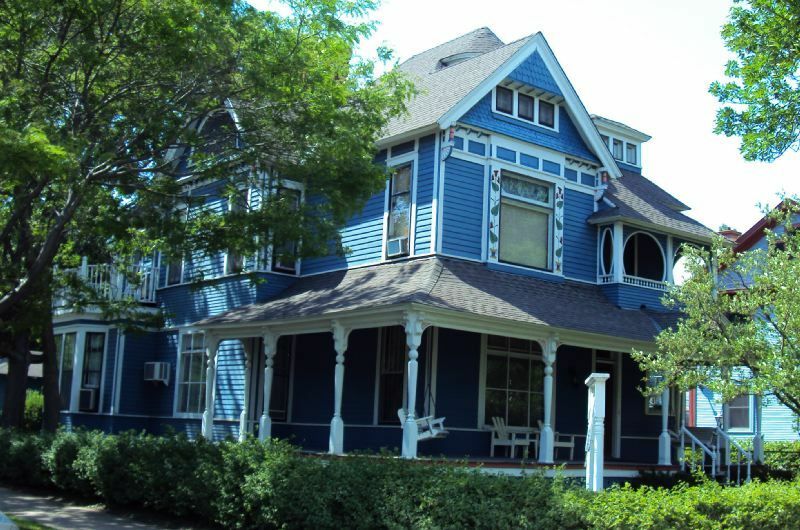 Constructed in 1888 for John Young, treasurer of a Minneapolis gas company, and designed by Charles Sedgwick, this is a beautiful example of the classic Queen Anne style. One of the most striking and unique properties in Old Highland, this classic Queen Anne is so decorated with interesting architectural elements and details, one hardly knows where to look first! 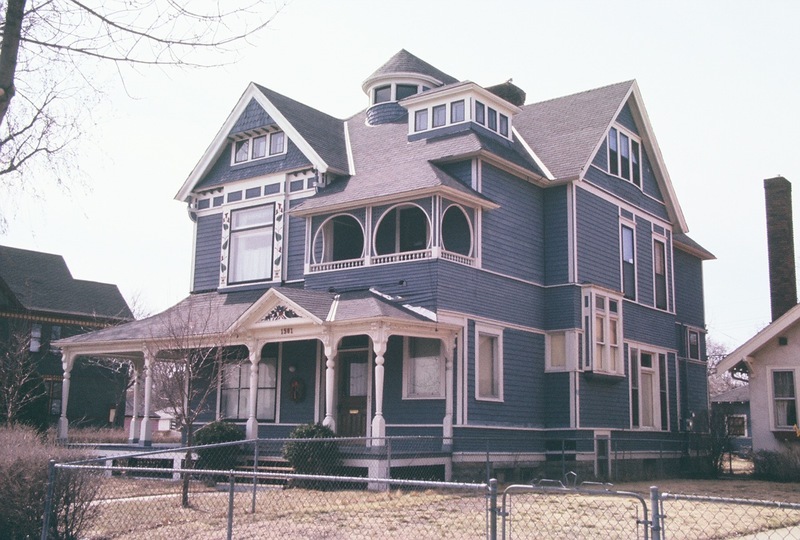 Fred Neet describes the abundant Queen Anne features: "Asymmetry, an attic tower, wraparound porch, and numerous details. Other dominant features are circular openings on the second floor deck, its large mass, and carved, dramatically pointed decorations bordering the second-floor picture window and the entry pediment. Projecting triangles in the dominant front and side gables are clad with patterned wood shingles. Dentils grace both gables. Corner boards and a horizontal belt course are emphatic, as are window and door surrounds. Both front and back porch supports are heavy turned spindles. But much more can be added to Neet's analysis. The major elements of the Young House are almost completely asymmetrical: Entry north of center and door off-centered from the porch entry; peaks on one side with slopes on the other; circles and squares. A full-width porch extends along one side wall. Textured shingles and projections avoid a smooth-walled appearance. Most window and door surrounds have simple casings. Other unique details include lathe-turned porch columns that have an interesting inverse tapering to the middle part of the column. The porch beam incorporates small spandrels with incised lines, and brackets supporting the roof eave make for a simple but elegant architectural design. The porch skirt boards have an interesting diamond pattern, alternating from near top to near bottom of the skirt board. A highly-decorative pediment incorporates floral-themed patterns, with bird and ribbon. 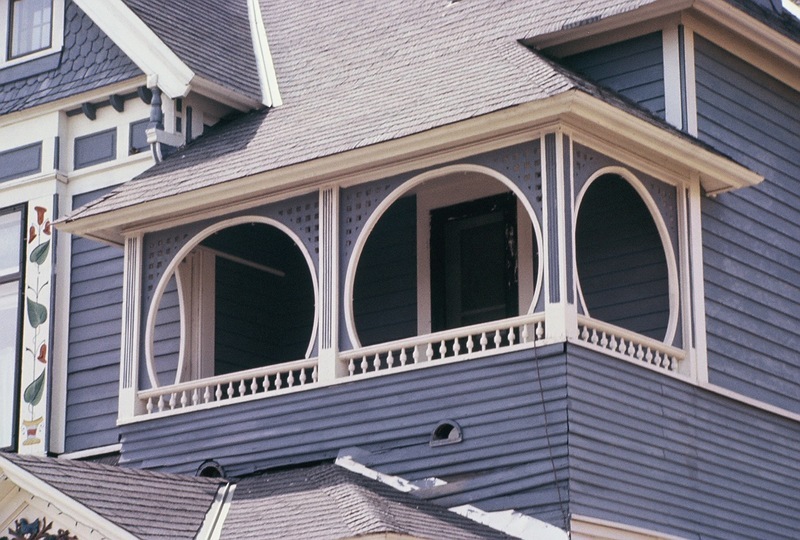 The corners of the porch are engaged columns with a fluting pattern. The roof support is a quarter-round bracket, supporting a short beam which in turn supports a squat, lathe-turned column. The column, in turn, supports a beam above, giving structural support to the edge of the roof. The top gable has a projecting gable face above a small, three-part window; the face of the gable is an interesting pattern of cut shingles, which flare out at the bottom to meet the projecting part of the frieze at the top of the second-floor wall. Like homes on other corner lots in the neighborhood, the south elevation benefits fully from its corner presentation, with a projecting square bay with a half-circle opening, and many windows adding more light inside. The room toward the rear extends out with a hexagonal bay facing south. 2Borchert et al. 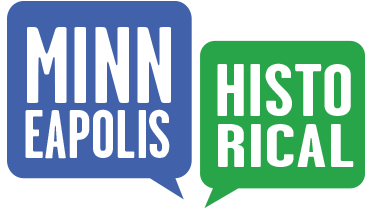 Legacy of Minneapolis: Preservation amid Change. Voyageur Press: 1983. Old Highland Neighborhood Association, “1501 Dupont Avenue North: John Young House,” Minneapolis Historical, accessed April 18, 2019, http://minneapolishistorical.org/items/show/23.